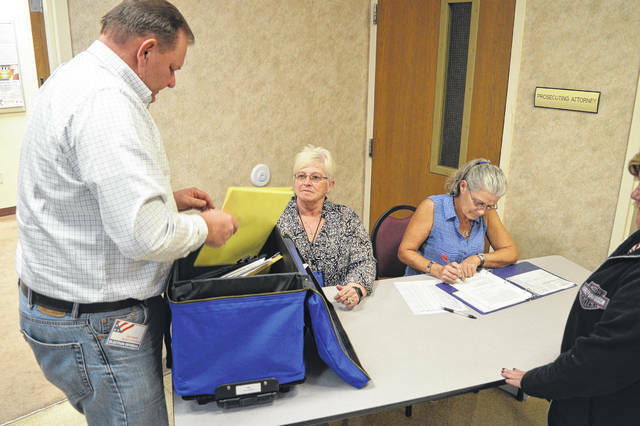 Voting results roll into the Gallia Board of Elections in November 2018. GALLIPOLIS — The Gallia Board of Elections is anticipated to replace its aging electronic touch voting machines with paper ballot reading machines in this upcoming November election. The state is set to contribute around $427,000 to the effort to upgrade the machines. Gallia County reportedly started using its touchscreen voting machines in November 2005. Whitt said the Ohio Secretary of State is strongly encouraging the machines be in operation before the 2020 election. Reportedly, there will be one machine per polling location with 26 precincts to cover. One will also be housed in the Board of Elections Office in the Gallia Courthouse for early voting measures. The upcoming local election will include two city commissioner seats to be considered, one township trustee and fiscal officer for township seats. The Gallipolis City Schools Board will have three seats to be considered and Gallia Local Schools Board of Education will have two seats to be determined. Village councils and mayors may be considered as well. The executive director said, to his knowledge, around 10 Ohio counties would also be making the change to paper ballots. There are a total of 88 counties throughout the state.